Sometimes an email crosses the desk that just makes you gasp. This was one of them. 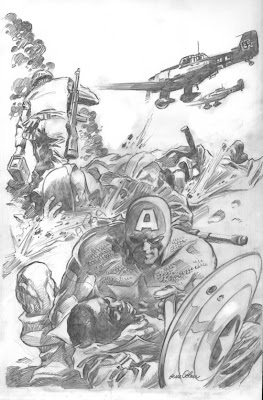 Gene Colan is selling the original art to what might well be the last comic book story he ever draws: Captain America #601. The art is on-line, in it's entirety, for all to see and bid upon. Seeing the whole story in it's purest form is worth a bid in it's own right, so I strongly suggest that people pop over to Gene's site, check out the pages, and the sweet cover, and then start placing some high bids. But for a spare $50,000, I'd be bidding for the lot. Recently on the Jack Kirby Yahoo list there’s been a lot of discussion about stolen artwork, centering on both Kirby’s own Marvel artwork, and the recently donated art for Amazing Fantasy #15 by Steve Ditko. Part of the debate has been to establish the difference between what is classified as ‘theft’ and what is classified as ‘liberated’ when it comes to original comic book art. My views on this subject are very clear, but this illustrates it better than anything. Company x bought and paid for artwork that rightfully belongs to them. It's awesome artwork on the level of Kirby. They were going to use it, but for reasons unknown they're sitting in a shelf to be destroyed at a future date to make room for some orange crates coming in as that's now their new business. The following is the text from a letter that was recently posted onto eBay. 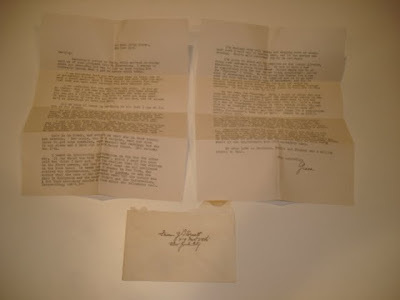 Dated, 1st March, 1939, the letter was written by Bill Everett's mother and relates to Bill working on a new creation for Lloyd Jaquet - the man who founded Funnies Inc, a company that produced Marvel Comics #1, which would lead to the formation of Timely Comics, later to become Marvel. As people who read this might well be aware, Bill Everett was one of the pioneers of comic books, and if all he ever did was create Namor, The Sub-Mariner, then his place in history would be well and truly cemented. As it stands he did much, much more. Seeing how it's the cricket season, I thought I'd once again dip into my collection of original newspaper clippings, scrapbooks and the like and find some interesting gems. 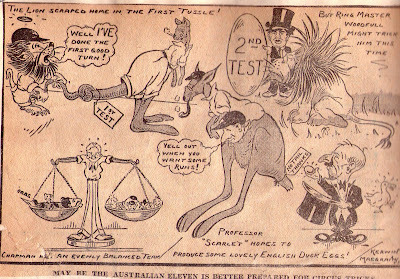 In this case I decided to scan a few bits from a scrap book of clippings and reports of the 1930 ASHES series, the series where Bradman and Grimmett virtually beat England on their own. By the time the Second Test rolled around Bradman had already made his mark. He had made 1000 runs in a calendar month (May)and had scores of 8 and 131 for the First Test. He was a certified run machine and spectators came to the games, it seems, solely to see him bat. In the Second Test he didn't let anyone down, other than the home side, as he finished the game with scores of 254 and 1. The clearly defined pattern was that if England couldn't bowl Bradman out cheaply, then it would cost them dearly. Even then the score of 254 wasn't nearly enough. It's amazing what you can stumble upon at garage sales and the like. 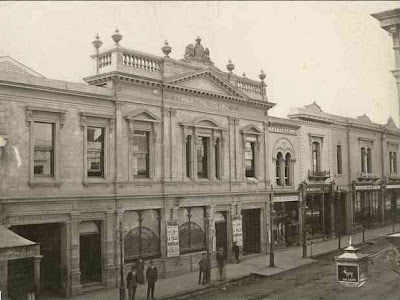 This programme cost me a whopping $0.20, incredible when you consider that I've dated it to circa 1907. That might not be a massive date, all things considered, but for a disposable paper item such as this, printed on not the best paper stock around, it's very impressive indeed. Ya know, it's kinda sad when even the spammers can't be bothered trying anymore. Go ahead, click and enlrage it - it's weak at best.